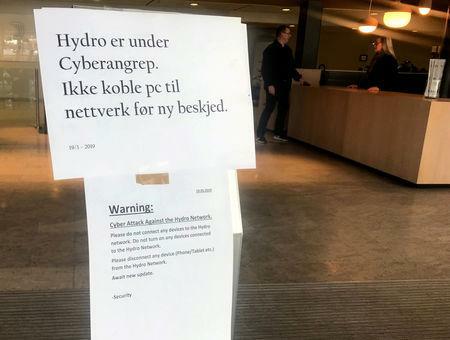 OSLO (Reuters) - Norsk Hydro, one of the world's largest aluminum producers, has made some progress restoring operations but is not yet back to normal after it was hit by a ransomware cyber attack, the company said on Wednesday. "Hydro still does not have the full overview of the timeline toward normal operations, and it is still (too) early to estimate the exact operational and financial impact," the company said in a statement. But Hydro said its technical team, with external support, had detected the root cause of the problems and was working to restart the company's IT systems. "It's an isolated event," NorCERT head Haakon Bergsjoe told Reuters. Norsk Hydro's shares rebounded on Wednesday, trading 1.0 percent higher at 1005 GMT, compared with a 0.1 percent fall in the Oslo benchmark index. The price of aluminum fell 0.1 percent on the London Metal Exchange.